I had visions of this being WAY too sweet but surprisingly, it isn’t. Although I don’t cook with honey often, I had to try this recipe combining chocolate with honey. The original recipe uses a chocolate ganache icing but I opted for my own butter cream with cocoa powder. 1. Preheat the oven to 350°F (180°C). Grease a 9 inch springform pan and line the bottom or use cupcake papers in a cupcake pan. I used the miniature cupcake pans. 2. In a large microwave-safe bowl combine the chocolate and butter and microwave until in 30 second bursts (stirring every time in between) until melted. This should take about 90 - 120 seconds. 3. Whisk in the eggs, one at a time, until fully combined. Add the honey, milk and sugar and whisk well. Sift in the cocoa powder, flour, baking powder and baking soda and stir until just combined. 4. Pour into the prepared baking pan and bake for 45-50 minutes. The cake will rise quite a bit but it should NOT overflow. Once the baking time is up it will still feel very soft and it will also lose some height, especially in the center. But don't worry - it will be completely fine. Let it cool in the pan for 15 minutes before removing the sides and allowing the cake to cool completely on a wire rack. For cupcakes, just remove and place on cooling racks. Now the decision is to ice or not to ice. I sometimes prefer my small sweet treats just as they come out of the oven. I freeze individually and then have something sweet later to enjoy with a hot cup of tea. Since this was my first time making this recipe, I decided to make my own butter cream icing with cocoa powder. It is nice to have one’s very own supply of honey samples. You know, just in case. If you decide to keep this as a cake, once the cake has cooled, level the top with a sharp knife. You shouldn't need to slice off too much and small differences in height can be made up for with ganache as well. 6. 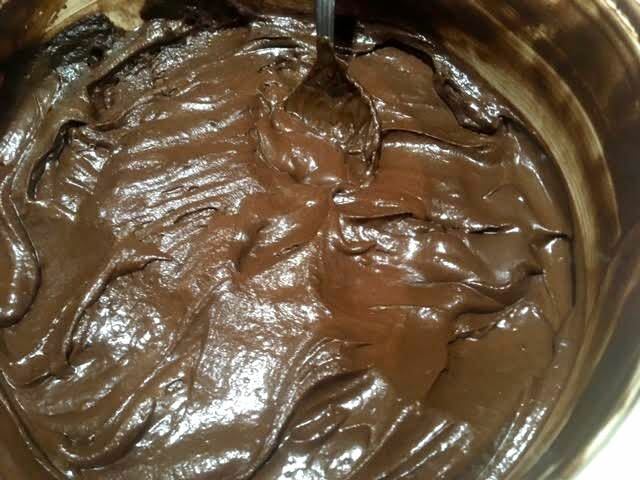 Make the ganache by combining the chocolate and cream in a small saucepan. Gently heat over medium-low heat while stirring with a spatula or wooden spoon. Once the chocolate has completely melted and the mass is smooth, cool to room temperature before coating the cake. Allow the ganache to settle before slicing. My British friend Gina made this recipe earlier this summer and it was delicious, especially when I found a piece several weeks later. This recipe makes one 9-inch pie. 1. Stir flour, salt, and sugar together in a large bowl. Add butter pieces and coat with the flour mixture. 2. Cut the butter into the flour mixture, working quickly until mostly pea-size pieces of butter remain. Do not over blend. 3. Combine water, apple cider vinegar, and ice. 4. Sprinkle 2 tablespoons of the ice water mixture over the flour mixture, and mix and cut it in until fully incorporated. 5. Add more ice water mixture, 1 to 2 tablespoons at a time, until dough comes together in a ball, with some dry bits remaining. 6. Squeeze and pinch with your fingertips, sprinkling dry bits with more small drops of the ice water mixture, to combine. 7. Shape the dough into a flat disc, wrap in plastic, and refrigerate for at least 1 hour, preferably overnight, to give the crust time to mellow. Wrapped tightly, the dough can be refrigerated for 3 days or frozen for 1 month. 1. Have ready and frozen one pastry-lined 9-inch pie pan, crimped. 2. Position a rack in the oven center. Preheat oven to 375°F. 3. In a medium bowl, stir together melted butter, sugar, cornmeal, salt, and vanilla (paste or regular vanilla). 4. Stir in honey and eggs one at a time, followed by the heavy cream and vinegar. 5. Place the frozen pie shell on a rimmed baking sheet and strain the filling through a fine-mesh sieve directly into the pie shell, or strain it into a separate bowl and then pour it into the shell. Bake on the middle rack of the oven for 45 to 50 minutes, rotating 180 degrees when the edges start to set, 30 to 35 minutes through baking. 6. The pie is finished when the edges are set and puffed up high and the center is no longer liquid but looks set like gelatin and is golden brown on top. 7. Allow to cool completely 2 to 3 hours. 8. Sprinkle with flake sea salt. 9. Serve slightly warm or at room temperature with a dollop of whipped cream. The honey pie will keep refrigerated for 4 days or at room temperature for 2 days. Also freezes REALLY well and is especially delicious when you find a frozen piece you forgot you had in the freezer at the end of a busy day in my bee garden. An old prescription for a cough medicine recipe with honey that still works today! Between honey and whiskey, I definitely have more honey readily available but a recent gift of whiskey made me think of this old cough medicine recipe and whiskey sours. I remember working in London many years ago during a rainstorm during the 50th Anniversary of D-Day. We had worked straight through three shifts. I had laryngitis from all of the talking and we were dead tired and soaking wet before our team made it back to our hotel. We were so tired we couldn't sleep so we agreed to change out of wet clothes and meet at the bar for a night cap. By the time I made it to the bar, there was a whiskey sour waiting for me, prescribed by our resident doctor for my sore throat. Or so they told me at the time. I am not a hard liquor drinker but I was told to down it in the interests of getting better quickly. Boy, did that whiskey sour taste good! "Combine bourbon, lemon juice, and simple sugar syrup in a cocktail shaker. Fill shaker with ice, cover, and shake vigorously until outside of shaker is very cold, about 20 seconds. Strain cocktail through a Hawthorne strainer or a slotted spoon into an old-fashioned or rocks glass filled with ice." A few days later, someone else ordered me a whiskey sour. I took one sip and didn't finish it, it did not taste as good as when I had been soaking wet and speechless. So go ahead, make yourself a whiskey sour. It will never taste better than when you need it for a sore throat and use honey instead of the sugar syrup mix. Did I mention I don't drink? You don't need the bee hive cake form to make this cake but it sure is cute, isn't it! Position a rack in the lower third of an oven and preheat to 325°F. Grease and flour a beehive cake pan; tap out excess flour. To make the cake, over a sheet of waxed paper sift together the flour, baking powder and salt; set aside. In the bowl of an electric mixer fitted with the flat beater, beat the butter on medium speed until creamy and smooth, about 1 minute. Add the granulated sugar and lemon zest and continue beating until light and fluffy, about 5 minutes, stopping the mixer occasionally to scrape down the sides of the bowl. Add the eggs a little at a time, beating well after each addition. Beat in the vanilla just until incorporated, about 30 seconds. Reduce the speed to low and add the flour mixture in three additions, alternating with the milk and beginning and ending with the flour. Beat each addition just until incorporated, stopping the mixer occasionally to scrape down the sides of the bowl. Add the lemon juice and beat for 30 seconds. Spoon the batter into the prepared pan, spreading the batter so the sides are higher than the center. Bake until the cake begins to pull away from the sides of the pan and a toothpick inserted into the center comes out clean, 55 to 60 minutes. Transfer the pan to a wire rack and let the cake cool in the pan for 10 minutes. Meanwhile, make the glaze: In a small saucepan over medium heat, stir together the honey, lemon juice and salt and bring just to a simmer, about 2 minutes. Remove from the heat. Tap the cake pan gently on a work surface to loosen the cake. Set the rack over a sheet of waxed paper, invert the pan onto the rack and lift off the pan. Using a pastry brush, brush the warm cake with the glaze. Let the cake cool completely, at least 2 hours. Drizzle royal icing over the top. Time to taste a slice of lemon bee hive cake! Honey sugar cookies sprinkled with sugar crystals before baking, now baked and packed for gifts. The holidays are over, I know, but with cookie cutters this is a recipe you can make all year. I found this basic honey sugar cookie recipe in an old recipe book my mother used to use. With some leftover honey taking up space in half-empty jars, I decided to try it since it cuts down the amount of sugar one uses in the basic cookie dough and liked the results. These work well as both very thin sugar cookies or the thicker cookies often decorated with icing during Christmas. These are not as sweet as some cookie dough recipes I have made so adding buttercream shouldn't make these too sweet like it can with other recipes with more granular sugar. I prefer mine quite think with a light dusting of sugar crystals before they are popped into the oven. Whisk the flour, baking powder and salt in a medium bowl. I sift them together into the bowl to make sure all ingredients are well mixed. Beat the butter and granulated sugar in a large bowl with a mixer on medium-high speed until light and fluffy, about 3 minutes. Beat in the honey, egg and vanilla until smooth. Reduce the mixer speed to low; beat in the flour mixture until combined. Save flour to keep dough from sticking to the cutting board and use spatula to remove cutouts. Position racks in the upper and lower thirds of the oven; preheat to 350 degrees F.
Select cookie cutters to use. Cut into shapes with cookie cutters. Add a dusting of flour if the dough sticks to the cutting board. A regular spatula dusted in flour helps to remove the cookie once it is cut out of the dough. Use a flour-covered spatula to remove the cut out cookie and move it to the cooking sheet. Arrange 1 inch apart on the prepared pans. If dough won't roll out, add a little dusting of flour to the roller and dough. Re-roll the scraps and cut out more cookies. If the dough is too soft to work with, refrigerate until firm again. Bake, switching the pans halfway through, until the cookies are lightly browned. I check at the 5 minute mark but they could take 1o minutes, less time if they are thin, more time if they are thicker. Let cool on the pans while you pour the glasses of milk. Honey sugar cookies embellished before cooking. Delicious without adding icing! This honey sugar cookie recipe also works well as refrigerator cookies. Well, freezer cookies would be more accurate because you're basically freezing the dough for later use. It's the same concept of the rolled dough available for sale in grocery stores without the preservatives. Place half the dough into center of wax paper, then roll back and forth to make a log. Wrap the finished dough into logs in wax paper and freeze. This recipe makes two logs about 10 inches long. Fold corners at each edge, then place the cookie dough in wax paper in freezer. You might want to date the dough although at my house it doesn't stay in the freezer for long. When ready for cookies, heat oven. Slice the log into round cookies to bake as needed. Add sugar sprinkles prior to baking. This would be handy to have in the freezer for those drop-in friends looking for a cup of coffee and a cookie - you know who you are! Honey peanut butter cookies are recommended to leave for Santa. 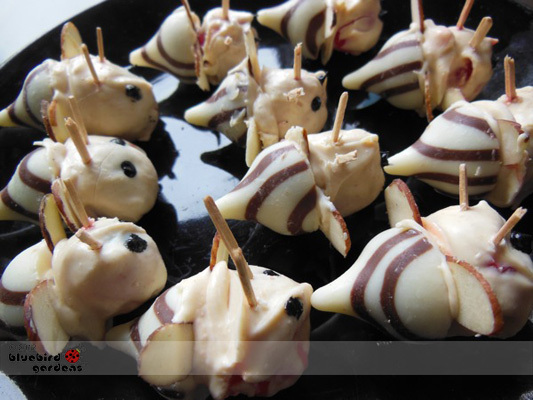 This recipe had samples on a plate recommending them as a treat for Santa. They even appeared as if Santa had been there to sample but it was October so that just wasn't possible but I believed, just for that one moment when I saw the half-eaten cookie. Making cookies is a wonderful tradition this time of year, especially to introduce little ones to cooking. Mommy and Me Cookbook has some wonderful simple cookie recipes. Honey Peanut Butter Cookies Recipe is another recipe that was entered in the Missouri State Beekeepers Association fall 2017 cooking contest. The cookies looked so pretty with the bee imprint in the center, a very nice touch. In mixing bowl, mix shortening, peanut butter, and honey. Add eggs; mix well. In a small mixing bowl, combine flour, sugar, baking soda, baking powder, and salt. Add to peanut butter mixture and mix well. Roll into 1 to 1 ½ in balls. Place on un-greased baking sheet and flatten with a fork. Sample to make sure they are good enough to leave for Santa, then place on dish, leave by Christmas tree and get everyone to bed! If crumbs are any indication, this looks like an excellent Honey Cheesecake! 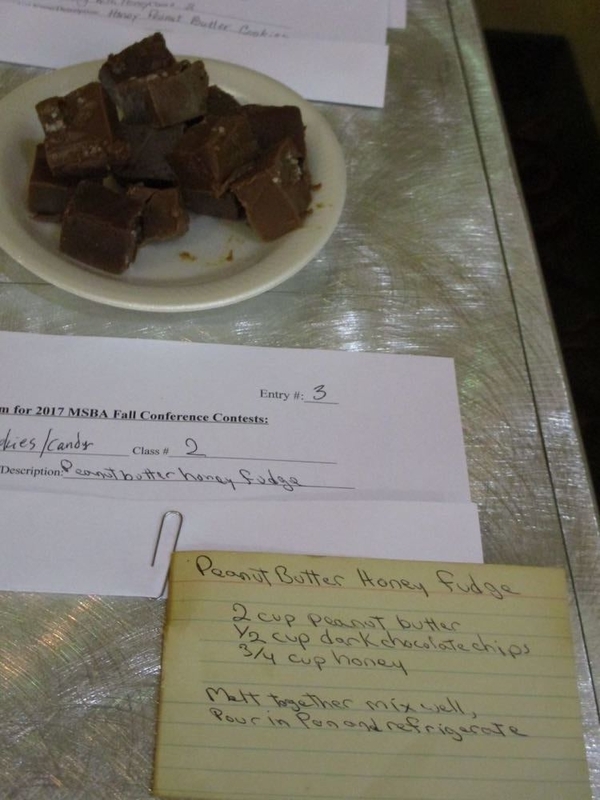 This is another honey recipe from the October 27-28, 2017 Missouri State Beekeepers Association fall conference baking contest. They had a variety of entries, from breads to fudge and I focused on the entries at the end of the table, the cakes. I know but someone had to do it! When it comes to cheesecakes, I have made a number of them in cupcake pans so they can be offered in individual servings. Cooking temperatures need to be turned down just a bit since they will cook faster in the smaller cooking containers but I place them in pans of water, just as I would the larger cheesecake pans. Definitely follow the instructions to move the oven shelf; it will make a big difference in how the cheesecake evenly bakes. This would be another wonderful recipe to add to a gift recipe book! Preheat oven to 350° and place oven shelf in the center of the oven. Wrap the outside of a spring form pan with foil. Generously butter the inside of the pan. In a large bowl, beat cream cheese and butter until smooth. Mix in honey and cornstarch. Blend in sour cream and whipping cream. Add amaretto and vanilla. Stir in eggs and egg yolk one at a time, mixing thoroughly between each addition. Bake on the center rack of the oven for 70 minutes. Doesn't this loaf of bread look delicious? It's made with buttermilk and honey! If there is one thing that reminds me of home cooking, it is making bread. 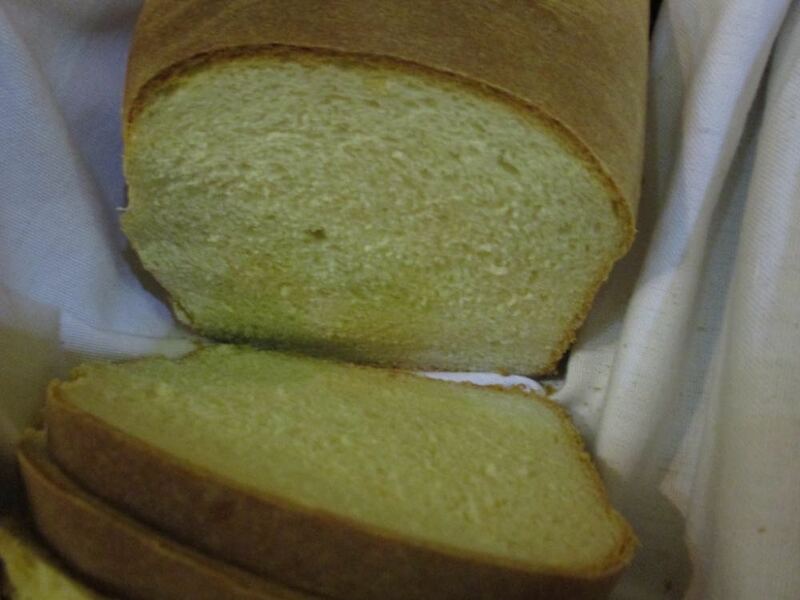 One of my brothers is an expert at it, making a variety of delicious breads including one he developed on his own. I have also tried recipes out of some vintage cookbooks including the 1976 Home Cookin' Cookbook, which has a charming quilting theme to its cover, another hint of home. Back to breads. This is another recipe from the 2017 fall Missouri State Beekeepers Association conference, this one a bread recipe with buttermilk and honey. This recipe makes two standard loaves of bread. What I found interesting about this recipe was that it includes ginger as one of the ingredients. In a medium sized bowl mix the yeast, ginger, sugar, and warm water. Set aside for 5 minutes or until foamy. Whisk the buttermilk, honey, salt, and baking soda together and add it to the yeast mixture. Add 3 cups of flour and mix until smooth, about 3-5 minutes on low of a stand mixer. Pour in the butter until it’s completely mixed into the batter. Add the rest of the flour, one cup at a time, keeping the mixer on low speed. When the dough pulls from the side of the bowl remove it from the mixer to a lightly floured surface, kneed until elastic and smooth. Place into a greased bowl, turn to grease the top, and cover with clean tea towel. Allow the dough to rise for 1 1⁄2 hours, or until double. Punch down, and form into 2 loaves. Place in greased loaf pans and grease tops. Cover and allow to rise for 45 minutes, or until it’s just at the top of the bread pan. Preheat oven to 400°. Bake for 30 minutes. You can cover with foil if it browns to fast. Remove loaves from oven and brush with melted butter. Allow to cool in pans for 10 minutes. Gently run a knife around the edge between the bread and the pan to loosen it. Turn out and cool completely on a rack. Cover the loaves if you want a soft crust. Fluffy Honey Orange Cake at Missouri State Beekeepers Association Oct. 27-28, 2017 conference. If you remember the moist bundt cakes of the 70s and 80s you will love this honey cake recipe. The orange zest adds another favorite flavor although I never did figure out how to make that lemon glaze that was so popular over bundt-shaped deserts. I guess I could have looked up the recipe but where is the fun in doing that? In the meantime, here is the recipe for Fluffy Honey Orange Cake. Note this does not use a box cake mix but you could substitute one if you wanted to try something simpler. Directions: Using a hand mixer beat the yolks with the honey until frothy and thick. (About 3 minutes). Very slowly add the oil, and beat until creamy. Add potato starch, orange zest, and liqueur. Now add the flour (Mixed with baking powder) a little at a time, alternating with the orange juice. In a separate, clean and degreased bowl mix together your egg whites with a pinch of salt until stiff. Gently fold the egg whites into the batter. Pour mixture into a bundt pan that’s been greased and dusted with flour. Bake at 350° for 30-35 minutes. 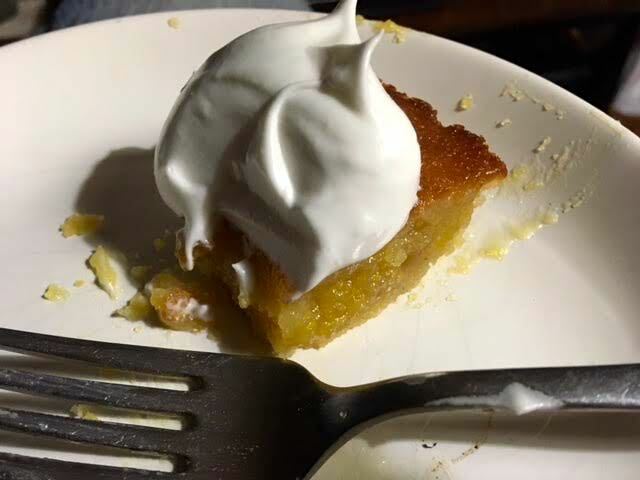 Or until done when tested with a toothpick Glaze: Mix together ¼ cup powdered sugar, 4 tsp orange juice, 1 tsp vanilla and spoon onto the cake while warm. I would also be tempted to make these into muffin-sized servings and freeze them for later de-thawing. Did I mention this recipe won first place in the cake category at the fall state beekeeping conference? Well, doesn't matter, really, take my word for it, this is a wonderful cake recipe worth making for any occasion. It's a must to add to any recipe book you may be writing, I sampled it a couple of times, just to make sure. Fluffy Honey Orange Cake, left, among other entries in the state conference baking contest. And if anyone needs a taste tester for any future contests, do let me know! 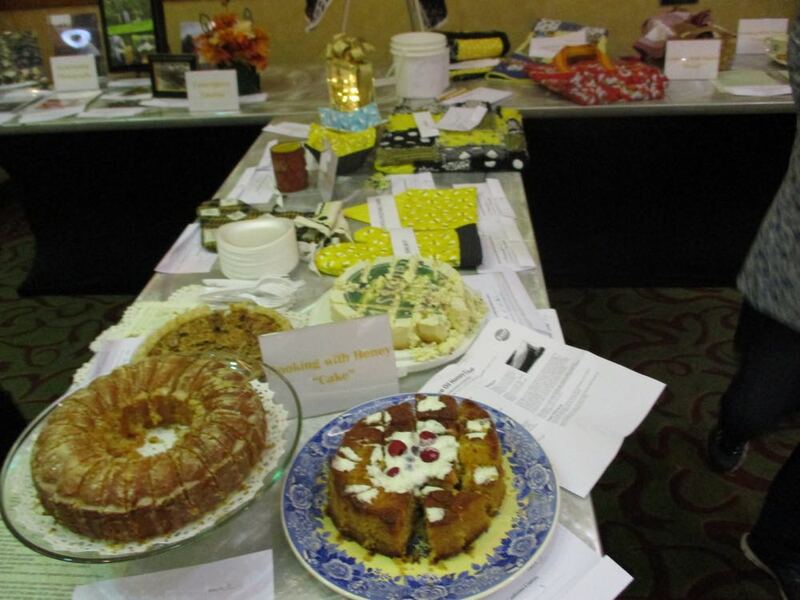 Entries in Missouri State Beekeepers Association fall conference cakes and pies contest. It's a tough job but somebody has to do it. At Missouri State Beekeepers Association annual fall conference in Springfield October 27-28, 2017, I was the self-designated cake and pie tester. Oh, they had an official judge for the contest, I just volunteered to myself that I should make sure the entries were as delicious as they looked! There were several categories in the food contest, from breads and cookies to the one I took very seriously. Sitting at the end of the middle table, the four entries beckoned. There was a New York cheesecake; an Olive Oil and Honey cake (amazingly moist, will share that recipe, too); a third cake and the crowning glory of 4 most delicious entries, the pecan pie. I almost passed on the pie, there was no utensil nearby and all forks were gone but a passing friend loaned me his new fork so I could take a sliver. Doesn't this look delicious? Winning 1st Place in the cakes and pies division, this delicious honey pecan pie recipe. I like pecans, and I like pecan pie. So does one of my brothers so when I taste recipes, the discriminating criteria is would I want to add this recipe to the family recipe books I made years ago as Christmas presents. It wasn't easy to wrestle favorite recipes out of the hands of the cooks so I paid a visit and wrangled the recipes when I was there. The family loved the recipe books so much, I thought updating them would be nice if I had interesting recipes. For example, I make pumpkin custard without the crust. Baked in glass baking dishes and cooled once cooked, it's delicious and cuts a few calories. Here is the winning recipe for Honey Pecan Pie in the baker's handwriting. 1 cup pecans, mixed into the first 7 ingredients. You can also add 1/2 cup chopped ingredients to the top. All recipes are printed in the November 2017 Missouri State Beekeepers Association newsletter, cost $10/year. Finding good honey recipes can be a challenge but when one has tasted them first, you know, to confirms the deliciousness, that makes it easier to say "THIS" is a good recipe using honey. A friend sent me this recipe and I tried making a small batch to taste. Delicious! 3/4 cup room temperature butter. Whip with room temperature butter. Store in refrigerator for up until 2 weeks. This would make a great gift idea for Valentine's Day or Mother's Day with breakfast served in bed! Jam is so five years ago; show you're truly cutting edge by preserving your fruits in a honey sauce. All it takes is one part honey to ten parts water and then covering your berries. Pretty much the closest you're ever going to get to bottling up a little bit of summer. 10 - 12 squat half-pint canning jars, with caps and rings.